Space… the final frontier. Unless you’re Captain Nathan Romanis that is, in which case ‘space… the massive battleground’ would be more accurate, you and your squadron fighting the Zatros empire with everything you’ve got in an effort to reclaim your home. 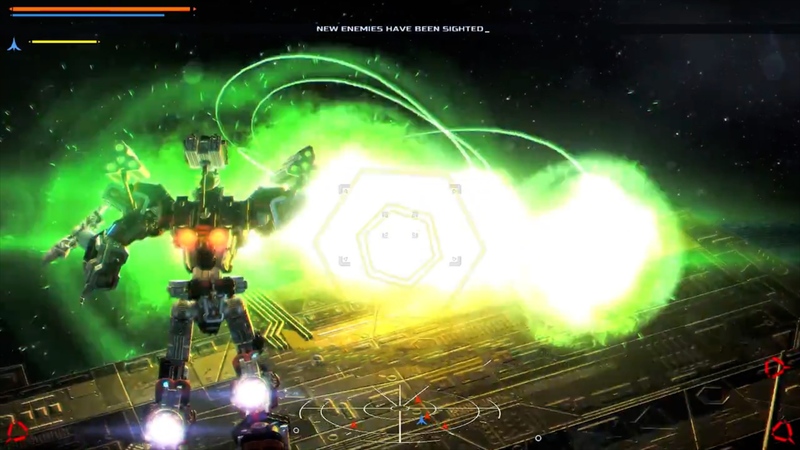 Oh, and the weapon of choice in War Tech Fighters is… a giant mech! Okay so they’re actually called ‘War Tech’ in this game, but let’s face it: they’re giant mechs. In space. Nothing but good stuff if you ask me, and while players will be able to upgrade and customize – both visually and in terms of battle prowess – their War Tech of choice, it actually ain’t all about combat. I mean, sure, your goal is to lay waste to the Zatros empire, but that doesn’t mean a little stealth is out of the question. Or does it? After a devastating war, the ruthless Zatros empire claimed the home planets of the Hebos and Ares colonies. Pilots from the remnants of the shattered colonies fight fiercely for their independence in fully-customizable mechs called War Tech. Short version: No. Long version? Well, as the developer puts it, “high-risk stealth missions, navigating through radiation fields, intercepting coded messages and solving environmental puzzles are all in a day’s work for pilots”. Also, since I highly doubt the coat of paint you apply to your War Tech matters much for infiltration missions, be sure to go nuts when coloring your giant weapon of mass destruction in the hangar. Although some time in the simulator prior to embarking on a dangerous mission might not be a terrible idea – unless of course you’re too badass for such tutorial-esque nonsense. If that’s the case, by all means, head on out and venture forth, deep into enemy territory where several dozen single-player missions await alongside Survival mode, packed with challenges and… how about that #1 spot on the leaderboard? Flight suit up! Note: if you’re attending PAX South (Jan. 18-20, 2019), War Tech Fighters awaits in booth 11204. War Tech Fighters is on Steam ($19.99), and will be on Switch, PlayStation 4 and Xbox One, come Q2 2019. War Tech Fighters – Coming Soon!